Ranveer Singh and Akshay Kumar to reveal secrets on Karan Johar’s talk show. Koffee With Karan Season 6 will soon be back on television screens to give us some insight into the lives of the country’s most well-known figures. 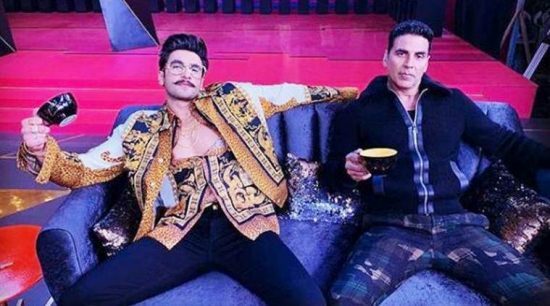 While the first episode will host actors Deepika Padukone and Alia Bhatt; Ranveer Singh and Akshay Kumar will be warming up the couch in one of the episodes of Karan Johar’s talk show. On Saturday night, Karan, Ranveer and Akshay shared a couple of photos on their social media handles, promising a fun-filled episode. Ranveer, who is famous for his quirky sense of style, amazed with his Versace attire, while Akshay kept it classic with a black jacket and camo pants. Karan shared one photo introducing the two Bollywood stars and wrote, “The koffee boys in the house!!! Wild whacky and beyond!” In another photo, we see Ranveer, Karan and Will Smith sharing the frame. Now, that makes us wonder if Will Smith will make a cameo during the Akshay-Ranveer episode.